There were moments in nearly every conversation with Kathleen Stein when you could sense that she was on the brink of saying something — or not saying it — and was weighing the words she would use, or not use to make a point or launch a critique or deflate a pomposity. Or just let things go. Letting things go was not Stein's style. Generally, she chose to speak up, and when she did her words were always well-chosen, with attention paid to specificity if not to tact. But that didn't matter — she was not being rude. There were points to be made, not points to be scored, and that very crucial difference set Kathleen apart conversationally as surely as did the quality of her arguments, her insights, her mind. Kathleen died instantly last Sunday, in a fall during one of the hikes that she loved. Stein, during her long — epic! — tenure as staff writer at OMNI, became one of the very best writers on science, and particularly neuroscience, in the country. Her stewardship of the magazine's legendary interviews is the prime reason they are legendary.She followed science with the assiduousness of a good reporter, and pursued its explication for general audiences with the enthusiasm of an evangelist. Which last is a strange, but deliberate choice of words — Kathleen had less use for or belief in anything supernatural or mystical than anyone I have ever known. She was a rationalist and an articulate one, who did not tolerate the word "nonbeliever" because it implied that there was something she chose not to believe in. Which she knew there wasn't. She came to science writing and editing the old-fashioned way, working her way toward her own best metier one story at a time, in various fields. 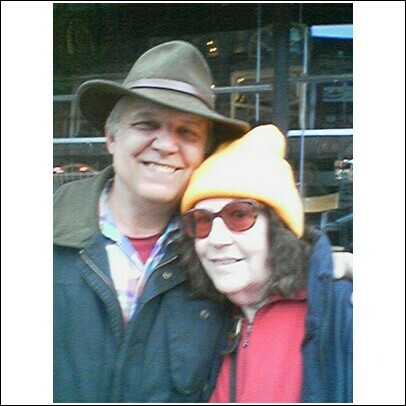 She was a rock journalist for awhile, and a good one, writing for Circus, Creem, and others. Lester Bangs referred to her as "Kathi" Stein, but she used another variant spelling when, as Cathi Stein, she wrote Elton John: Rock's Piano Pounding Madman in 1975, when Elton"s and Stein's careers were both relatively new. How she hated to have that little book mentioned! But she hated it with a twinkle — which she would deny existed — in her fierce eyes. It was an honest piece of work-for-her, quickie paperback dues-paying by a journalist headed for other things. Those other things could have been anything — Stein was interested in all of it, and could write well about any of it. At OMNI she turned her interest in everything into writing, and editing, pieces on everything -- neuroscience was her passion, but she was a grand generalist, and could write as well about the broad intersections of science and culture, as she could about the minute and minutely specific details of cortical structure. Damned right — and a damned good book it is, a careful, and carefully written, examination of the prefrontal cortex. The last time I saw Stein in person, she joined my son and me for a beer on a gorgeous New York Saturday afternoon, four years ago this week. We spoke often — though not, now, often enough — on the phone, but being with Stein in person was a richer wonder, one that I always looked forward to, even when I saw her nearly every day at the office. That Saturday it had been a few years since I'd seen her in person, but she was still Stein — how could she not be — and in the course of a couple of hours the three of us spoke of many, many things. At one point, we were talking of Norman Mailer, who had died just a few weeks before, and Stein said that his death felt "like one of the foundational pillars of the universe had been removed." I feel that way now, about her, about a universe without her. As I understand things, it was probably an injury to the prefrontal cortex that killed Kathleen last weekend. And if so, one can imagine that final instant of her consciousness being pure Stein, observing as she died the effects of gravity upon her own cortex. That's too facile, of course, and far too easy a search for some comfort. Kathleen wouldn't have allowed me to get away with that, were she here to glance at this piece. I will miss her for the rest of my life, but I will also for the rest of my life be grateful for the pleasure and the privilege of having known Kathleen Stein. Keith, thank you for putting this out there. She loved her days with Omni, as well as her associates. She was the most interesting person I ever met, proud to be her brother. Keith, Yes, thank you for putting this out there. Like you eloquently said, unfortunately, I now realize just how too little I saw her in person. She was such a magnificently brilliant and inspirational woman. I'm truly honored to call her my Aunt Kathleen. Kathleen was my best friend’s sister. We grew up, sort of, revering her superior intellect. She and her sister controlled what they could but we scored, regardless. Kathleen was my surrogate sister and at the end of the day and through life I thought of her as a silent mentor. She had a look that said just what needed spoken. I am so sorry to hear of her death. She will not be forgotten. On this first day- of the New Year, the first year in my entire life without my sister Kathleen as "a (monumental) pillar," I just want to belately thank you for this wonderful, insightful writing in celebration of her and her life. Here you have given me, and her family and friends, a marvelous, lasting gift,..one that for which my words can hardly adequately describe our appreciation. She spoke of you often, and I know she also treasured your friendship and expertise. Maybe one day we can meet.